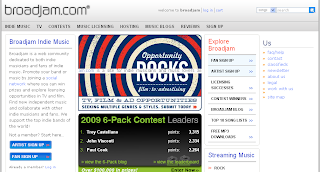 Informtainment.com by ORLANDO: Broadjam: Free music promotion,etc! I was reading one of my favorite blogs recently; Shoemoney. I recommend Shoemoney to those persons who are interested in turning their blog into a brand/money maker. Every Friday Shoe Money has a "free shirt friday". They picked Broadjam.com for this past friday. I check out the site and loved the concept. Sell music downloads (Sell for $.99, Keep $.80! )-Cannot beat this? Naturally, I went to search for Caribbean genres of music, there were some. However, for all the Caribbean music that exist; we should have more music represented on this website. They offer features for TV & Movies licensing and much more. I think the West Indian community should be aware of this. The site starts off with Free package but additional feature will cost up to $200 USD a year.